Do you know how our garden grows? Well you can by simply subscribing to the TMA Garden Blog. It’s easy, just go to the subscribe box located on the top, lefthand side of the blog and sign up. 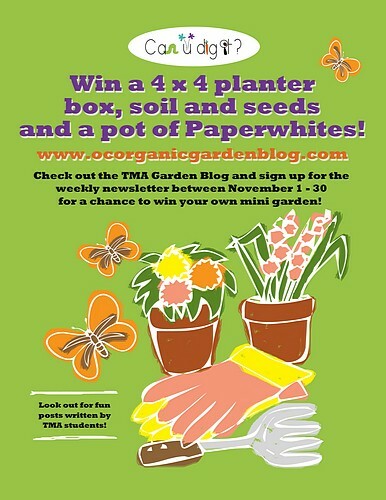 And if you subscribe during the month of November, you’ll be entered to win your own mini garden. The TMA Garden Blog is great way for you to see what the kids are growing and learning in the garden. Each grade has it’s own curriculum where they’re combining their math and science skills in a hands-on, interactive setting. After you sign up, you should receive an email alert each time a new blog has been posted. Don’t forget to subscribe in November to be entered to win your own mini garden.